Working Apple 1 from the November 2013 Breker auction. On Saturday Cult of Mac reported that a working Apple 1 failed to sell at auction in Germany, a notable result in the growing market for vintage Apple collectibles. It turns out that result was premature: the Apple 1 did sell for €246,000 ($330,000), after bidding on the item had closed. This Apple 1 came from the original batch of 50 that Jobs and Woz sold to the Byte Shop in 1976. 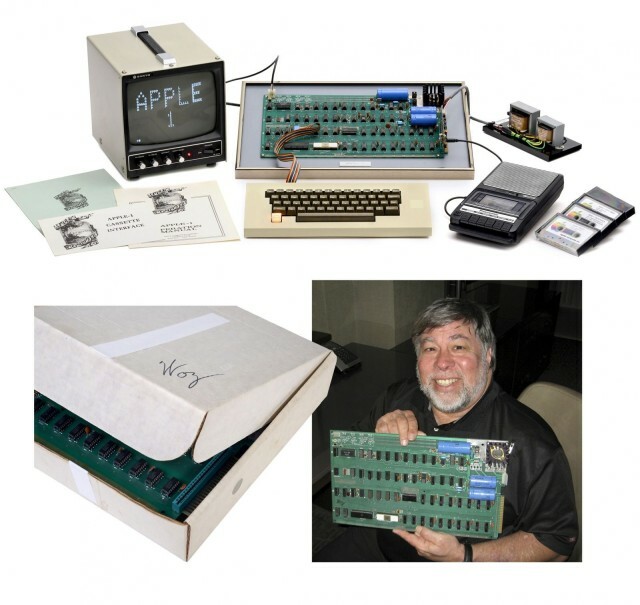 It was numbered 46 and included the original operation manuals, software cassettes, and shipping box with a signature from Woz. $330,000 represents a softening of the Apple 1 market by about half – Breker previously sold an Apple 1 for the record setting price of $671,000 – but this doesn’t represent a total collapse. A necessary market correction to a Silicon Bubble, perhaps? Apparently a few people realized the chance to acquire a working Apple 1 was too good a deal to pass up! On the 16 November 2013 the icon of computer history sold for an historical price for the third time in a row at Auction Team Breker in Cologne, Germany. The 1976 Apple I was the first PC in the world to offer monitor and keyboard access. Not only were the monitor, software and peripherals in near-mint working condition, but the motherboard also retained its original cardboard shipping box that had been signed and authenticated by Apple’s co-founder Steve Wozniak ! The computer was number 46 in Jobs’ and Wozniak’s earliest order of 50 units by Apple’s very first customer, Californian electronics chain the ”Byte Shop”. The first series of Apple computers were assembled in the Jobs’ family house before the youthful firm moved into its now legendary garage workshop in his parental home. The scarce photograph shows a pile of identical white boxes awaiting shipment in one of the bedrooms. The buyer from Overseas wants to be anonymous. Nearly 150 years older, the world’s first commercially produced calculator, Thomas de Colmar’s 1835 ”Arithmometer”, in ornate boulle case sold for a new world record price of € 233.650,- / US$ 313,000.- to a new home in the country of its creation, France.